Don't. Be. A. Boozy. Bride. I know, I know, people who know me and are reading this will be thinking "well, isn't that strange advice for Brittany of all people to be giving", referencing my close relationship with red wine, tequila and vanilla vodka, but that's at OTHER people's weddings, not my own you sillies. Bottom line, this is one of the most magical days of your life and you will want to remember the special speeches people say to you, visiting with relatives you haven't seen in ten years and the sweet nothings your new husband whispers in your ear during dinner. 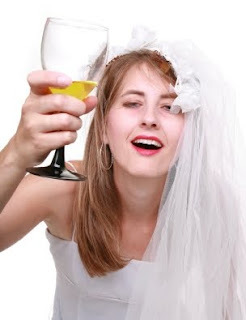 Being completely inebriated at your own wedding is something that you cannot take back. Please know the difference between tipsy and hideously drunk. But seriously, enjoy yourself, have some bubbly, a splash of wine but please oh please, do not be a Boozy Bride.